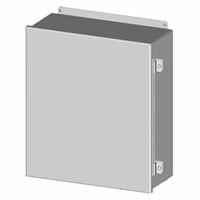 Save an Extra 15% on Saginaw CHNF Enclosures! Now through the end of November, save an extra 15% on our already discounted prices for Saginaw Continuous Hinge Junction Enclosures. Sizes from 4" x 4" x 3" to 16" x 14" x 10"
Semiconductor fan heaters prevent the formation of condensation and ensure an even temperature in enclosures. The integrated thermostat is used to set the desired temperature.